Positive Pressure Ventilation For controlling condensation particularly in the refurbishment sector, the BBA approved Lo-Carbon PoziDry offers a quick and simple solution. A loft mounted positive input fan draws fresh air from the insulated loft, filters it and gently feeds it into the dwelling via a ceiling mounted diffuser. Stale air in the property is forced out through the natural forms of ventilation, such as window mounted trickle vents. Installation The Lo-Carbon PoziDry can be installed in a loft space and can be suspended from a roof beam or be floor mounted, with a purposedesigned diffuser normally located over the stairwell of a conventional two storey dwelling or in the main hall of a bungalow. The Lo-Carbon PoziDry is set to the appropriate speed at installation based on the size of the dwelling, providing positive pressure input ventilation. Background ventilation openings provide the exhaust points. Performance The robust construction of the Lo-Carbon PoziDry features a specially developed Lo-Carbon DC fan/motor arrangement which runs quietly and delivers incredibly low running costs. The Lo-Carbon PoziDry uses a sensor to monitor the temperature in the loft, automatically adjusting the air volume when necessary. ‘Trickle’ speed is automatically selected when the ambient loft temperature is up to 18°C. ‘Normal’ is automatically selected when the ambient loft temperature is between 18 and 27°C providing partial heat recovery. 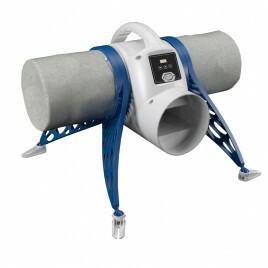 If the ambient loft temperature exceeds 27°C, the Lo-Carbon PoziDry will automatically switch to standby (no airflow). The standby power consumption is 2W. 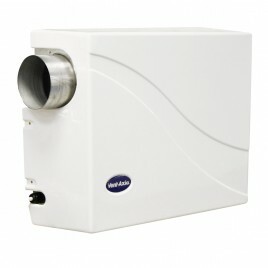 In the case of the integral 500W heater version, the heater element is automatically activated when necessary and tempers the supply air to 10°C. Can be used for air replacement in conjunction with an extract fan. Filter The unit includes a G4 filter with up to 5 years maintenance intervals to reduce the number of call outs needed throughout it’s life span. Day logger As standard. Measures the number of days the product has been switched on to provide precise running information. Speed Control With selection of 2 of 6 speeds available up to 50l/s, the unit is suitable for houses up to 360m3. Heater An optional comfort heater is available for operation when the incoming air temperature becomes low. Air Replacement Grille Set For air replacement through doors. Consists of a two-piece telescopic set, which fits unobtrusively on either side of the door panel. Minimum fixing thickness 30mm. Plastic. Dimensions: 454 x 90mm. Typical Specification The unit should be mounted in the loft space with a diffuser in selfextinguishing ABS positioned at the top of the stairwell. The unit meets the EMC and low voltage directives. Motor The electronically controlled DC motor is manufactured with long life ball bearings and is fitted with Standard Thermal Overload Protection (S.T.O.P.). Suitable for ambient operating temperatures of -25°C to +40°C.